Blackjack is a popular card game of chance and skill and it has many different variants. One interesting variant is Pontoon or Pontoon Blackjack. In the early days the game was considered a parlor game played by many families from time to time. The game play and rules of Pontoon differ slightly from the other variants. For instance, a Pontoon hand is the highest-ranked hand that consists of an Ace and a Ten, King, Queen or a Jack. The game is played with a couple of decks and the number usually depends on the number of players. Below is a complete in-depth overview of Pontoon. We have also suggested some winning strategy tips as well as places where you can play the game online. Pontoon is one of the first blackjack variants invented and it is quite popular world-wide. Once you learn the rules, the game is easy to play and with basic playing techniques you can increase your advantage. 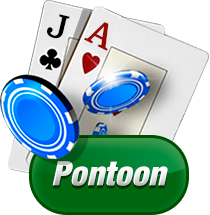 Pontoon also has one of the lowest house edges of all casino games and with good practice it may win you a lot of money. The highest paying hand is Pontoon or a 10-valued card and an Ace. The second best hand is a Five Card Trick hand that consists of five cards with a total value of 21 or less. Instead of Hit players say Twist, while instead of Stand they say Stick. Double Down is also replaced by Buying a Card. The blackjack variant uses eight decks of 52 playing cards, but any number of decks can be used. The decks are reshuffled before each game. Players are allowed to split any two cards equal in rank. They cannot split two 10-valued cards unless they are equal. For instance, two Jacks can be split, but a Jack and a King cannot. A pair of Aces can also be split and players get one additional card to each Ace. If the dealt card has a value of 10, then the hand is classed as Pontoon, not a blackjack hand. Once players get their initial two cards, they can buy a card in order to get a value closer to 21 or 21 exactly. However, they must place another bet equal to or not more than twice their initial bet. Buying a card after a split is also possible, but it can be done only once. The dealer can also add more cards to his/hers initial two cards and they are dealt face up. The dealer also stands on all 17s. If a player has an Ace and a 10-valued card, he/she declares his/hers hand by putting the 10-valued card face-down and the Ace face-up on top of it. Pontoon is paid 2 to 1, while a winning a Five Card Trick is paid 2 to 1. The house advantage of Pontoon is 0.39%. Pontoon differs from the other blackjack variations in terms of terminology, playing rules and, of course, playing strategies and skills. Therefore, you should familiarize with the game and see how it works before you make a real money deposit. Practice Pontoon in play-for-fun format before switching to real money. Always split a pair of 8s. If you are dealt a pair of Aces, twist your hand. If you have a pair of 5s, you should always buy a card. Stick a hand or stop drawing cards if you have a pair of 9s or a pair of 10s.